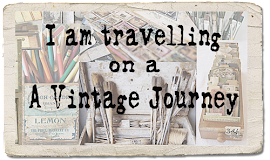 Welcome to our December Destination Inspiration - Julia A here to hopefully inspire you with my project using the items in this months Travel Bag. I feel like this month the train just may be the Polar Express!! 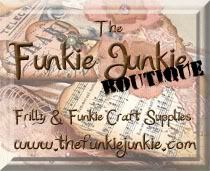 I created a little holiday decoration that could be on display throughout the winter months! I have a few photos showing just how this was created. 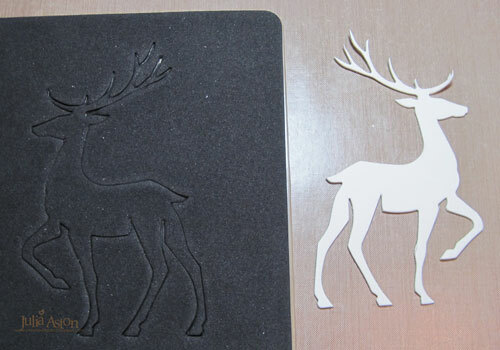 First I die cut Tim's Prancing Deer out of white mat board. Then I embossed him, front and back, using Aged Silver Frantage embossing powder - I love how vintage this thick powder looks! It's a little tricky to heat as a lot of it blows off when you try to emboss it - I blow it from underneath at first to start it melting, then move in from the top starting at a high distance away! The embossing looks gold in the photo but it is just the lighting on my worktable reflecting off it. 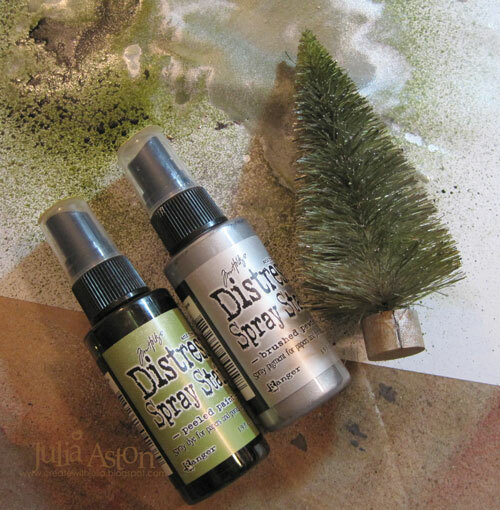 Next, I colored my bristle brush tree using Peeled Paint and Brushed Pewter Distress Spray Stains. The sprayer had clogged on my Brushed Pewter (!) - so I just poured some on the paper and added it to the edges and wooden base of the tree with my finger! 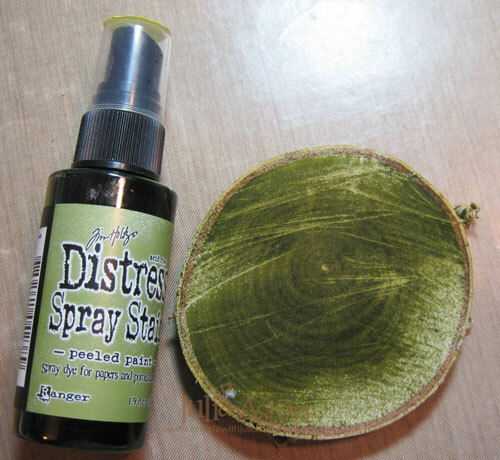 When I spray stain I put everything inside an old pizza box I keep under my work table! Then I sprayed a slice of aspen tree trunk with the Peeled Paint Spray Stain. We found a long piece of aspen tree that had fallen down along our local walking path - we took it home - and Kent sliced it up for me - I heated the pieces in my oven at 200 degrees for an hour to help dry it out. 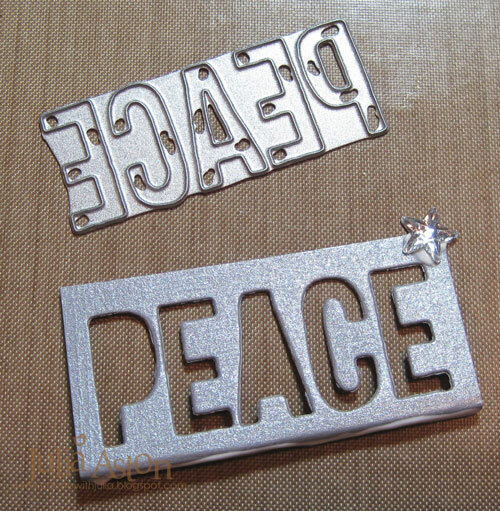 I die cut the PEACE from Tim's Holiday Words: Blocks out of brushed silver card, and folded over the bottom edge so I could glue it to the wood. I added Idea-ology Mirrored Stars to the tree top, the antler of the deer and the PEACE panel and then glued everything to the wood with Scotch Quick Dry Adhesive. I just glued the feet of the deer to the wood and it has held wonderfully - it is also very close to the tree which also helps hold it up. Here's a close up of the wonderful embossing, the lace knotted around his neck (the lace was just stiff enough to look like the wind is blowing it behind him!) I also added a black rhinestone for his eye. 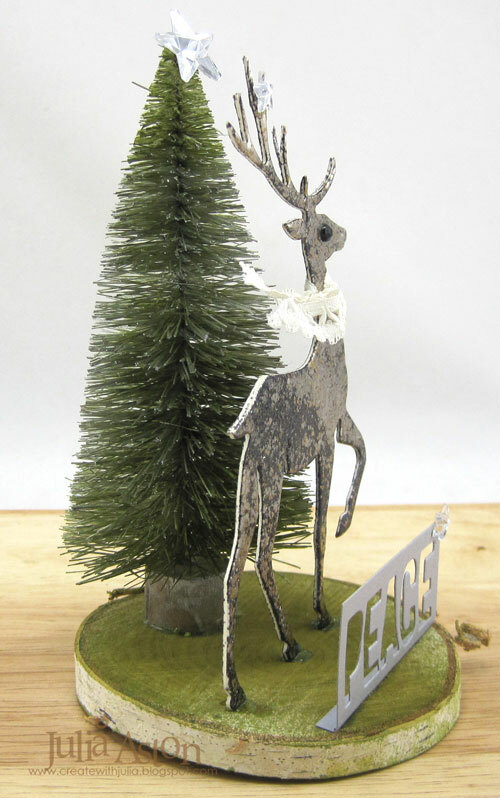 I hope you have been inspired by my little deer decoration - please check back here next Monday to see who will be at Terminal 2 with another project using the contents of our December Travel bag! Beautiful, Julia!!! 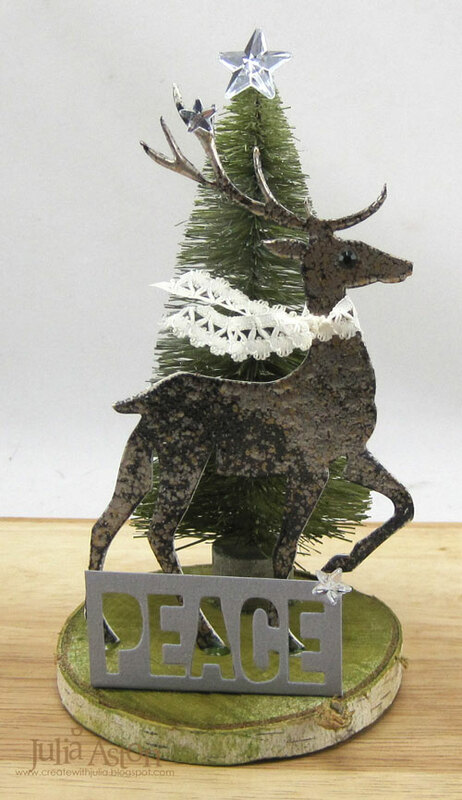 I love the aged silver embossing on your deer! 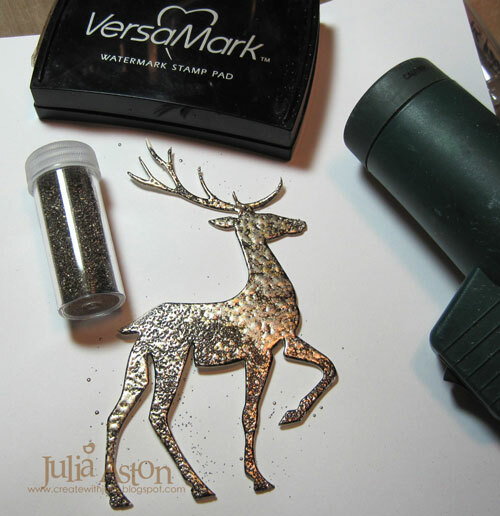 What a cool project Julia, love what you did to that deer, the embossing looks fantastic and tying the lace round his neck is such a clever way to use that item from te travel bag! 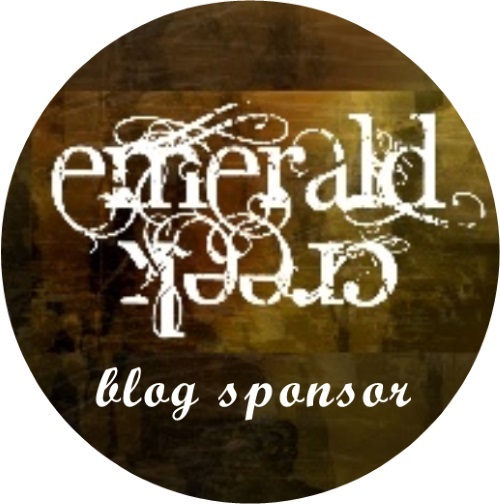 This is wonderful, Julia - I love the heat-embossed texture on the deer, and the fabulous earthy green tones. Great use of the travel bag contents! WOW this is fabulous Julia. This is fabulous ! 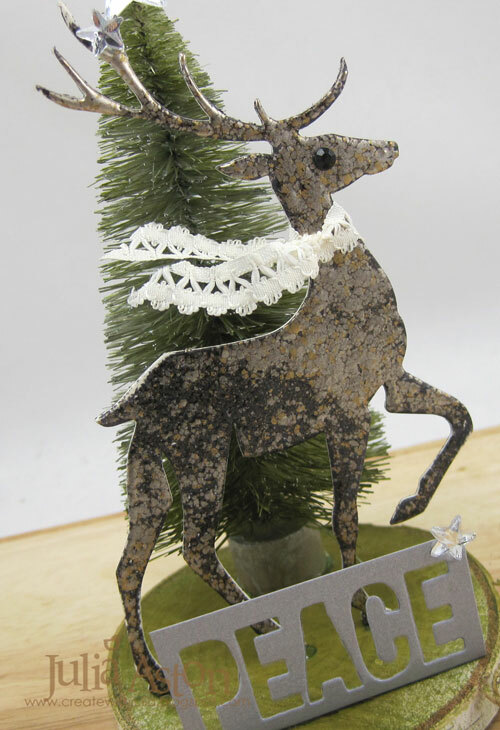 Julia Love the aged, metallic look of the deer and the way you've made the lace scarf seem like its gently blowing in the wind is a wonderful way of adding movement. The Aspen tree trunk makes for the perfect base . Inspirational use of the Travel bag supplies for sure .